Reusable 3-1/2" spring-steel clips firmly secure the replaceable cardboard ID tag to the end of your rolled material. These tags help with fast identification. 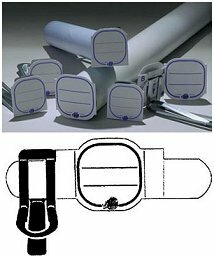 Use the Clipper Tag to easily identify your blueprints, building plans, maps, drawings and all rolled material. Neat, economical and easy to use. Blueprint Clipper Tags are sold by the carton; each carton includes 50 steel clips and 50 cardboard ID tags for a total of 50 Complete Clipper Tags. Cardboard ID Tag is 2" square.